In a week governed by playoff narratives, the closest projected high-scoring game by Vegas is between two teams with no such aspirations. This matchup between the Falcons and Bucs has a projected total of 52, and a spread of just one point in favor of Tampa Bay. The Falcons have allowed the fourth-most DraftKings points to opposing quarterbacks, and the third-highest plus/minus. Their metrics aren’t much better against wide receivers: eighth-most in both categories. Atlanta is 29th in pass DVOA (per Football Outsiders). Credit: Kim Klement-USA TODAY Sports. Pictured: Tampa Bay Buccaneers quarterback Jameis Winston (3) and Tampa Bay Buccaneers wide receiver Mike Evans (13). Winston has played well since returning to the starting role, completing 63.7% of his passes with seven touchdowns and just two interceptions. Winston has also rushed for at least 20 yards in three of five starts. Evans, meanwhile, is very quietly having a spectacular season. He is third in the NFL in receiving yards, and averaging 17.7 yards per reception. Only 15 different wideouts since 2000 have managed to average more than 17.0 YPR on at least 120 targets. The Eagles need a win and some help to make the playoffs, so we should be getting their best effort in this matchup with a scrappy Redskins team. Darren Sproles being back in the fold has complicated the Eagles backfield, but Adams has still been the preferred option in the run game when the game-script has been good for Philly. Over the past three weeks, Adams has 18 of the Eagle’s 33 carries when they had a lead or the game was tied. The Eagles are favored by a touchdown on the road at some books. Adams missed some time two weeks ago with an injury, had more snaps than Wendell Smallwood (25 for Adams compared to 16 for Smallwood) and more carries (13 to one) in Week 16. The Redskins have allowed 99 rushing yards or more in eight straight contests, with an average of 146.25 yards per game on 5.02 yards per carry. Being a big favorite is always good for a defense, but it also helps that Washington is down to their fourth-string quarterback. Josh Johnson has started two games and played in another, and has posted a 4.7% interception rate with a 7.2% sack rate. Those numbers would rank second and 11th-highest among qualified quarterbacks this season. The Packers have been eliminated from the playoffs, but have shown no desire to shut down Aaron Rodgers or their offense in the waning weeks of the season. 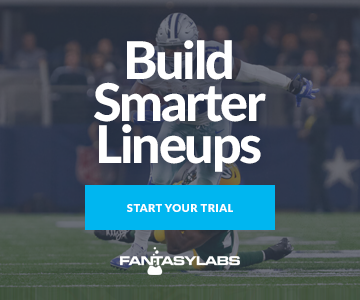 Last week, Rodgers was magnificent in a shootout with the Jets, throwing for 442 yards and scoring 45.88 DraftKings points. This matchup is arguably better, with the Lions ranking last in pass DVOA. Adams has been the focal point of the Packers’ passing game all season. He owns a 28% target share and a 0.68 Weighted Opportunity Rating this season, both top five numbers in the NFL. He also finds himself very close to a major milestone. Kumerow played on over 60% of the Packers’ snaps last week, and now finds himself in line to start in Week 17 if Randall Cobb and Equanimeous St. Brown cannot return from head injuries. Kumerow caught a touchdown in Week 16, and had two other during the pre-season, where he showed real chemistry with Rodgers. Best of all, the rookie is low-priced and will likely be low-owned. Golladay is the obvious play on the opposite side of this stack. Since Marvin Jones started missing games in Week 11, Golladay owns a 28% target share and league-leading 0.82 WOPR. The Green Bay secondary is the easiest one he has faced in weeks. The Packers are 27th in pass DVOA and allow the fifth-highest average plus/minus to opposing wide receivers. After losing to the Seahawks on Sunday night, the Chiefs now need to win in secure the top seed in the AFC. A loss could cost them a bye and home field advantage in the playoffs, as they would slide all the way to the fifth seed with a loss and Chargers win. At least to start this contest, Kansas City should be rolling most of their starters. Not only do the Chiefs have the highest team total on the week, but 54 points is one of the highest Week 17 game totals ever. The Chiefs have been of the most potent offenses in the entire NFL this season, and scored 40 points the first time these two teams hooked up in 2018. Oakland is 31st in pass DVOA, and 32nd in DVOA against tight ends. Kelce has been the best player at that position this year, and even at such a high price, owns the best points per salary projection in our models. Hill is perhaps the most volatile Chief, but is reasonably priced, particularly on FanDuel where he is under $8,000. On the Oakland side, Nelson has become a top target for Derek Carr of late. He has 36 targets the past four weeks. Though he hasn’t scored a touchdown in that time frame, this is likely a good matchup in which to end that streak. The Chiefs are third in points allowed to opposing wide receivers.